Chase Utley has never wanted to be in the spotlight, but there's little he can do about that tonight as he makes his return to Citizens Bank Park as the Dodgers take on the Phillies in a clash of top division teams. Utley spoke with the Philadelphia media for nearly 20 minutes on Monday, reminiscing about his 13 seasons with the Phillies while singing the praise of a fan-base that views him as one of the greatest athletes to play in Philly over the last quarter century. The 39-year-old announced last week this will be his final season on the diamond. The second baseman has spent the past four seasons in Los Angeles with the Dodgers. He'll be in the starting lineup tonight. "I'm excited for it, but I don't know if I'm ready for it," Utley said. Utley acknowledged the timing of his retirement announcement coincided with the fact the Dodgers were coming to Philadelphia immediately after the All-Star break. "I've been thinking about this for a while now and trying to figure out how I wanted to go out," Utley said. "I thought it was important to let the Philadelphia Phillies fans know that this is the last chance I'm going to have to play in this ballpark. That was a huge factor." 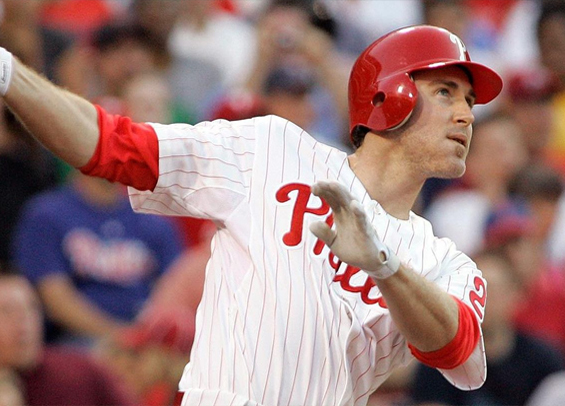 Utley's blue-collar, hard-nosed mentality was a perfect match for Philadelphia. He led by example, not fear. He never was the vocal guy in the clubhouse, but he did what he needed to do to make those around him better. His talent was inferior only to his baseball I.Q. He prided himself on knowing strategy and thinking two moves ahead of everybody else. That's what made him so good. That's what makes him a potential candidate, down the road, for enshrinement in Cooperstown. Utley was a five-time All-Star during his 13 year stint in Philadelphia. He also was a four-time Silver Slugger winner and ended his time with the Phillies with 233 homers and 996 RBIs over 1,551 games played. His name littered across the franchise leader board. "I never played this game for awards, to be honest," Utley said. "I played for a while and put up some really good years, and not so good years." The Phillies have said they will formally celebrate Utley at some point next season, so until then the next three nights appear to be Utley's farewell as a player in Philadelphia. "This city and everything about it is an experience I'll never forget," he said. "We had great success here and the way this city supported those teams, it was pretty remarkable." Of course, should the Phillies and Dodgers both make the postseason, the potential exists that he'll be back in Philadelphia for an encore. "It would be a trip," Utley said with a grin.